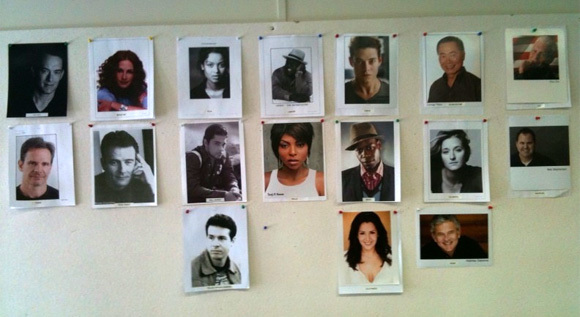 If you didn't already hear, the casting story of the weekend came about when Tom Hanks posted a TwitPic of his casting board for his upcoming film Larry Crowne on Twitter. It's a new film that Hanks wrote and is directing (and starring in) and we didn't know who else was going to be in it until recently. The funny part is that the photos were kind of hard to decipher and multiple websites banded together to try and solve who each of the headshots were. Luckily, they seemed to have figure out almost all of them, or at least the most important ones, since it's full of a lot of lesser known up-and-coming actors. But we've got a good list below. Yea, there are some very interesting names, like Cedric the Entertainer, Wilmer Valderrama, and Taraji P. Henson, and some strong up-and-comers like Gugu Mbatha-Raw from "Doctor Who" and Jon Seda from "Close to Home" who is currently on "The Pacific" on HBO. As for that mention of Nia Vardalos, she helped co-write the script with Hanks, and everyone thought that was her in the photo at first, but apparently it has been confirmed that it's not her, instead it's fellow "Wizards of Waverly Place" actress Maria Canals Barrera. An interesting line-up but not that exciting to me, only because I don't really know that many of them at all. As a recap, Larry Crowne is a comedy about a man (Hanks) forced to reinvent himself and find a new career as he navigates the second act of his life. Some say the arrangement of the photos on the wall (in columns) means something as well about the grouping of their characters. Since we don't know much about the plot, I guess everyone is trying to read into this as much as they can to figure out what it's about. I'm curious to just let this develop on its own, because if Hanks is open and excited about tweeting about his cast wall, I can't wait to see how much more he's going to tweet about once they're in production. Stay tuned for updates! I believe "Unknown?" is Grace Gummer, but that's in no way confirmed. Either way, very impressive cast. It's nice of Hanks to keep his fellow 'Bosom Buddy' Peter Scolari working. Watching that show in '81, I never would've picked either of them as a double Oscar winner. When I saw the first ad for 'Splash' I said, "Hey it's that guy, from 'Bosom Buddies'. Now Hanks is that guy that's in everything, produces everything and has the two Oscars; and Peter Scolari has become that guy, from 'Bosom Buddies' (or maybe 'Newhart'). I love Rami Malek, I'm excited to see what he'll do working with Hanks! How come nobody mentions George Takei? A good actor with a familiar but fairly limited career background now working with the likes of Julia Roberts and Tom Hanks? Go George!